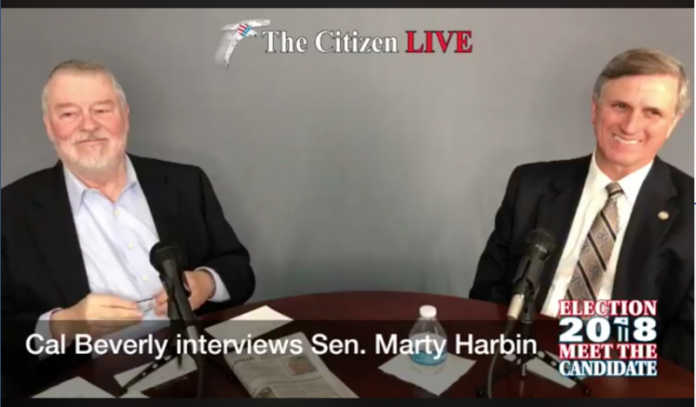 Screen shot of The Citizen publisher Cal Beverly interviewing state Senator Marty Harbin May 8. District 16 state Sen. Marty Harbin (R-Tyrone) on May 8 was interviewed by The Citizen publisher Cal Beverly on the newspaper’s Facebook Live site. Harbin faces Republican challenger Tricia Stearns in the May 22 primary. The interview began with Harbin being asked what prompted him to run for the Senate seat four years ago. Harbin said he and his wife prayed about running, which eventuated with him facing seven candidates. The interview turned to another topic, one that asked what laws Harbin made that became law, what laws he tried to make that have not become law and what laws he tried to un-make. “The first laws that we worked on were dealing with consumers with insurance,” Harbin said, noting his 40 years in the insurance business. One consumer bill dealt with life insurance that assisted adult family members in determining if the parent had such a policy. Harbin said another effort was the “distracted driver” bill, dealing with holding a phone while driving. Harbin said listening to the testimonies given on the issue necessitated the understanding that distracted driving be addressed. On bills he attempted that did not become law, one was the Religious Liberty bill. “If you look at it, we have federal religious liberty laws (Religious Freedom Restoration Act – RFRA) in place. The federal law was passed in 1993 and Pres. Bill Clinton signed it. In 1997, the Supreme Court ruled that each state had to make their own (law) to affect state and local law,” said Harbin. “What we did last year, it went to committee and passed the Senate but (that portion) never came out of the committee. Continuing on the RFRA topic, Harbin was asked to respond to Stearns’ previous comment that the act is not needed by virtue of First Amendment protection. Commenting on which laws he has tried to un-make, Harbin referenced a Sunset Bill that would require that examination of state programs and determine if they continue to be needed. Harbin said he tried to resurrect the bill. Harbin was asked to respond to an unfavorable mailer being sent to homes in his district. Harbin said he was pulled over in 2017 by a police officer for an expired tag. Harbin said he had previously sent payment for the new tag, though he had forgotten to get an emissions test. Current law said such a violation will result in impounding the vehicle. Harbin took issue with the mailer paid for by the Atlanta-based Georgia Coalition for Job Creation, a political action committee. Harbin said he did not send a text to Tyrone Mayor Eric Dial after the traffic stop, calling the allegation fictitious. Harbin questioned the principle of due process, questioning under what conditions the state has the right to seize property. Harbin recommended voters do an internet search for the Georgia Coalition for Job Creation. Harbin also recommended that voters note if a mailer comes from a candidate or from an organization. “I think the question is am I ‘get along, go along?’ I think the purpose is that I represent the people of my district. I’m not to represent the people in Atlanta. 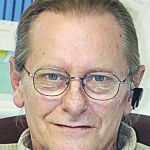 (The local people) have opinions that are important to me, and I believe it’s my responsibility to represent them and the issues that are there,” Harbin said. Citing an example, Harbin said he previously voted against transportation bills, but voted in favor of the most recent one. The previous bills did not give control to the counties, he said. Harbin commenting on another topic said big businesses have a voice at the Capitol. Small businesses do not have that voice. “We’re not to pick winners and losers (based on the number of employees). We need a level playing field,” said Harbin. Asked about his difference from Stearns, Harbin cited the protection of religious beliefs, referencing a Georgia case where a Christian man was asked to leave the area of a college campus because it was making others uncomfortable. Harbin also said he is pro-Second Amendment and pro-business. Again, based on the Stearns interview, Harbin was asked to comment on his opposition to tax incentives. Stearns in her interview said Harbin opposed the film and television and data processing tax incentives. Harbin said he voted against a sales tax exemption for data centers. “Why not give that (exemption) to the newspaper? Why not give that to anybody else? So, here’s a company coming in. And a data center doesn’t employ a lot of people. They have the capability of lobbying for that,” said Harbin. Next articleWho really owns the swamp?